Day 4 of the 30 day coloring challenge- I made a card a fun Bugaboo image. I used Distress Oxide inks for the background and watercolored with Distress inks on the image panel. 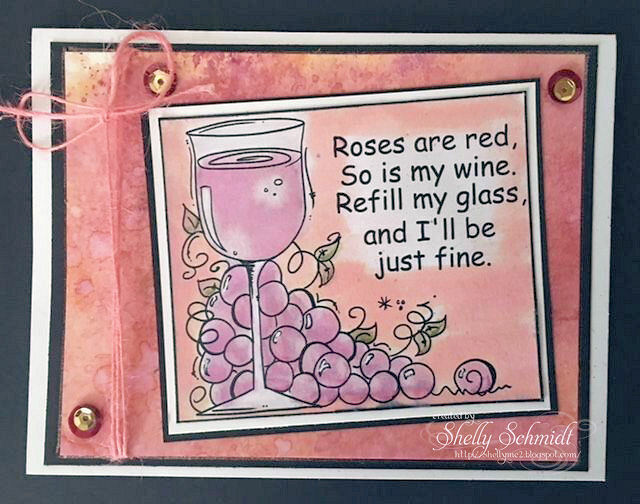 I added a bit of shimmer using Wink of Stella, and it water marked my wine...and I could not color back over it- beware my friends! The color is better IRL, I just love this sentiment and have the perfect person to mail it to! This image puts a smile on my face! Shelly, that is so gorgeous. Love the color....making me a little thirsty, hehe. Your card is very pretty, Shelly! 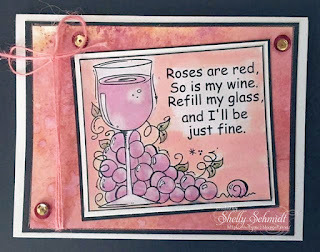 What a fabulously fun sentiment on this wonderful card, Shelly!! Thanks so much for entering your lovely creation in our anything goes challenge at Bugaboo Stamps this week. Good luck in the draw! Please join us again soon.